There are 6 manual wind calendar models in the vintage Hamilton lineup. They're part of the Dateline S-series. One of them is the 1966 Dateline S-676. It was produced for only the 1966 and 67 model years. The Dateline S-676 is one of two models with 10K rolled gold plate cases. 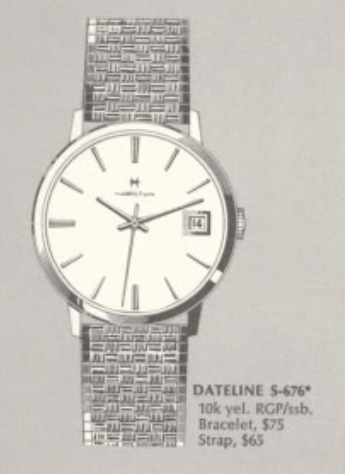 The other is the Dateline S-675. Unlike the S-675, the S-676 has a stainless steel back. My project watch arrived with an obvious issue - it doesn't have a date wheel. The window in the dial simply reveals part of the set bridge. The stainless steel case back shows some signs of prior attempts at opening the watch. This isn't a two-piece case though and it opens through the crystal. With the beat up crystal out of the way you can see that the dial has a few finish issues. The hands are blocking some areas of finish loss and the edges of the dial are a little wavy - it's not too bad though. The inside of the case back has a model number that ends with 66, indicating this model was introduced in 1966 . The 17 jewel 674 movement is used in all of the Dateline S watches. This movement is very dirty and in desperate need of a trip to the spa. There's a spacer ring that surrounds the movement and holds it firmly in the case back. Once the dial is removed, it's clear to see that this watch isn't just missing a date wheel. It's missing all of the parts for the calendar complication. This movement is basically setup like a Hamilton 688 at the moment. The automatic version of the 674 is the Hamilton 694. A spare donor movement will be able to provide all of the missing calendar-related parts. Before I clean the 674 I will strip the 694A of the needed parts. I'm also going to use the wagon-wheel shaped cannon pinion - as the 674's is a bit out of flat. The first thing I'll install is the jumper assembly and it's large horseshoe-shaped spring. This assembly will advance the date wheel every 24 hours. Flipping the movement over, all of the parts are added back until the watch is again ticking away. Time to put the movement on the timer to see how it's running. You never know what to expect when a project watch has been stripped of other parts. This movement could have hidden issues but the it has good motion so that's a positive sign. Well, looks like it's not too bad but I can reduce the beat error to near-zero without much difficulty. As you can see below the two lines have approached each other, indicating the balance swings equally from one side to the other. I'll leave it running a little fast as it settles in. All of the parts needed for the calendar complication are installed. Once the cover for the index lever and the hour wheel are I'm place the dial can go back on. There... all that's left is the dial and then to advance the time until the date changes. Then I can put the hands on to indicate midnight, when the date should change. A new crystal is definitely called for. A PHD 30.6mm will do the trick. This watch happened to have it's original Kreisler bracelet. My light tent exaggerates the flaws in the dial. It's really not that bad in my opinion. I don't think a dial refinish is called for - but that's a matter of personal preference. Beauty is in the eye of the beholder.